The flutterbug is set to capture baby’s imagination and stimulate the senses with its bright bold contrasting colours to encourage visual awareness, tantalizing textures and that encourage baby to explore and stimulate their tactile senses and jungling, crinkling and clacking sounds stimulate baby’s auditory senses. The adorable little flutterbug has a happy face with large friendly eyes, knitted crinkly wings with a multitude of textures and high contrast colours. 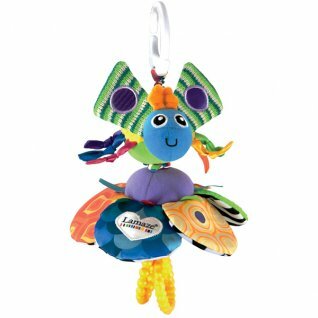 Flutterbug has soft satin knotty legs and is sitting on a brightly coloured flower, with colourful textured petals with high contrast black and white patterns on their underside, underneath the flower are two clacking teether rings for baby to chew on. When you pull flutterbug away from the flower it vibrates and returns to the flower engaging your baby and teaching cause and effect. Flutterbug also has a handy clip for attachment to a crib or stroller. • Brightly coloured to invite baby to focus. • Crinkles, jungles and vibrates to awaken auditory senses. • Intriguing textures welcome baby’s touch and encourage tactile exploration. • Made from all new materials, polyester fibers and cellophane. To learn more about Lamaze, their history and concept of design, check out our Lamaze Brand Information page.